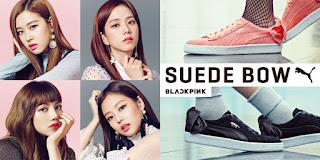 BLACKPINK Members for Puma Suede Bow - BLACKPINK is the queen of sport wear. They become a model of various famous sport wears, and now they are model for Puma Suede Bow new models. There are 4 colors of Puma shoes with Blackpink, these are black, pink, blue, and purple. Blackpink Jennie wears her favorite color black of Puma Suede Bow, meanwhile Blackpink Jisoo using pink, Blackpink Rose using purple and Blackpink Lisa using blue color of Puma Suede Bow. They are really matching with the model of the shoes as they are so swag and pretty as well. Blackpink Lisa never fail to impress us with her beauty face and swag look. Her perfect body look so gorgeous makes everything is fit with her. Her long legs makes her appearance so perfect and her gaze makes everybody falling for her. Puma Suede Bow pink is so perfect with Lisa body posture. Do you wanna look as gorgeous as Jisoo when you hang out with your friends? Look, Jisoo so pretty with her black shoes from Puma Suede Bow. She also smartly choose the black shocks with white pearl. And well, we never see Blackpink Jisoo is failed with her custom. Here is the pretty member of Blackpink, Rose. Her legs are so beautiful makes every girls envy of her. And Puma Suede Bow makes her appearance perfect her. Rose is so gorgeous with her shoes on, let your appearance as perfect as Blackpink Rose. Also Read : iKON Members are interviewed on Sabah Al Arabiya an "Arabic Show"
Here is the queen of swag, Blackpink Jennie. Her pure face always makes everything is perfect on her. She makes everybody love of everything she put on, her perfect legs makes everybody can`t take off of her legs.